PSEB 10th Result 2018: Punjab Board of Secondary Education is preparing its 10th Class Examination result. Students from Punjab can get their 10th Class Exam results soon on the official website. Previously the Board was trying to declare the results on 30th April 2018 but it was delayed due to some technical reasons. Students can expect their results in the coming days. The PSEB 10th Result 2018 will be declared on the official website pseb.ac.in. Over 4.5 lakh students appeared for the PSEB class 10th examination in Punjab State. The PSEB Class 10 examination 2018 was conducted from 12th March 2018 to 31st March 2018. Punjab board executed the 10th Class examination with utmost care. They installed CCTV cameras in the exam classrooms to prevent any malpractices during the examination. So it is very helpful for students and teachers to do the examination in a right way. The Result page of PSEB is redirected to indiaresults.com and that website is not saying anything about results. PSEB 10th Results 2018 will be available soon after the official declaration from the Board. Punjab School Education Board conducts the Class 10 and 12 board examinations in the state. It was formed through a legislative enactment in November 1969. Every year about 7 lakh students from the state appear for the Class 10 and 12 examinations. 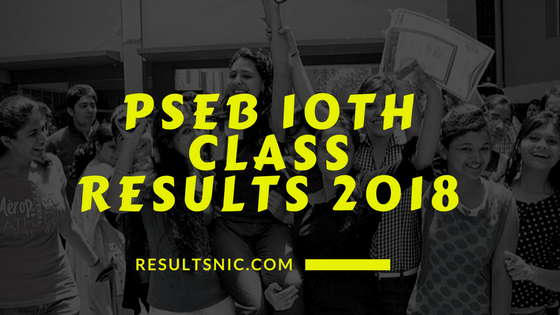 PSEB has already released the 12th class results in April 2018. The results of class 10 are expected any time now. After the official release of the results, the direct link to PSEB result page will be available. PSEB 10th Results are coming soon. Check the updates for correct information. PSEB will release an official declaration about the results when it is available. So keep checking the website and official channels for correct information about the result.